Ice skating can be great exercise, but foot pain is not fun. Figure skating’s not for sissies. Of course, you can ply yourself with cups of hot cocoa and wrap yourself in designer garb to keep you warm. 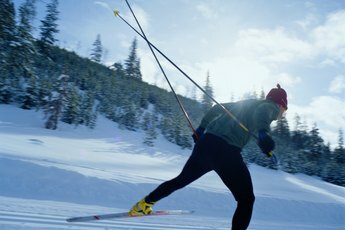 But if excruciating, throbbing, ankle-bending foot pain strikes, your Olympic dreams will be cut to the quick and you’ll find yourself out in the cold. Know how to prevent foot pain before it strikes, so that you can move on to a painless scratch spin and work on nailing that axel jump. Measure your foot and get fitted by a professional boot fitter. Boots need to fit snugly, but they should not be tied so tight that you can’t wiggle your toes in them. Many ice rinks have an experienced professional who will make sure you have the correct boot with the right fit for your feet. If your rink doesn't have an experienced professional, ask your skating coach or other skaters at the rink where they get their boots fitted. Some skate manufacturers will send professionals out to various rinks for boot-fitting sessions. Call the skate manufacturer of the boot that you are interested in and find out when they will be at a rink near you. Heat mold your boots by a rink professional to soften the hard leather. You can often get your boots heat molded at a rink that sells skates, or at the place you purchased the skates. By heat molding, a professional will put your skates into a specially designed oven to warm them. After they are warm, the boots are put on your feet so that they can mold to your foot as they call. Heat molding can shorten and sometimes even prevent painful "break-in" time, or the time it takes for the boot leather to soften. Any new pair of leather shoes can hurt your feet at first, since the leather is hard. Figure skates are designed to be very stiff, in order to protect your ankle during skating turns, spins and jumps. Heat molding the right boot with a good fit can eliminate foot pain and get you on the ice quickly. Wear light socks or skating tights in your boot. If you wear heavy socks, your boot won’t fit naturally and may be too tight, causing foot pain. You should feel at one with the boot -- as if your boot was an extension of your foot. Heavy socks could also cause your foot to sweat, which could make the boot feel uncomfortable. However, you shouldn't skip socks altogether. Without thin socks, you can get painful corns and blisters, which would make it hard for you to skate. Lace your boots tight enough so that the fit is snug, but not so tight that it hurts. Lacing boots too tight can cause lace bite, a condition that causes sharp foot pain due to compressed tendons. Skating boots that are laced too tightly can cause the tendons to feel chomped on, hence the name "lace bite." Make sure the blade is mounted corrected for your foot and that you are skating on the correct level of blade for your ability. 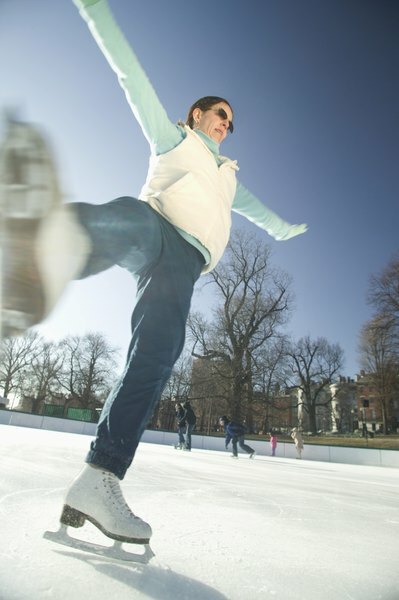 Blades must fit the skate properly, be placed on the skate correctly or they can cause podiatry problem and pain. Place an orthotic inside the boot to keep your foot upright if you have a pronating foot, meaning it turns inward by the arch. A pronating foot will tire the muscles in your foot, causing foot and ankle pain. An orthotic is a removable, custom designed insert that fit inside the shoe. Orthotics correct improper foot position, decreasing abnormal foot motion inside the boot. They keep your foot in the correct position inside the skating boot, eliminating or reducing foot pain. An orthotic not only prevents foot pain in a pronating foot, but it also can help your knees and back by keeping your body in correct alignment. Try a lighter boot. Boots that are too heavy for you make skating more difficult and can contribute to boot pain. Heavy boots are designed for advanced skaters who need a great deal of ankle support for landings of major jumps. Find out if your boots are too heavy by weighing both boots and then weighing yourself. Divide your boot weight by your body weight and multiply that times 100. This is your ratio of skate weight to body weight. Ratios of more than 5 percent of skater weight to boot weight may contribute to foot pain and increased rate of injury, according to figure skating podiatry expert Linda Tremain, PT, ATC/L. Tremain recommends resisting buying a trendy or popular boot and going with a boot that fits your body weight, foot type and skating ability. Invest in custom boots that will be tailored to the shape of your foot, if you have tried the above steps but still have foot pain. Resist lacing new boots all the way to the top for the first week of use. Tie them at about three-fourths of the way up, leaving the top two prongs opened until you’ve broken-in the boot. Try wearing your new skates around the house with guards on when you can to help break them in and get used to them. If you’re going to use an orthotic, make sure it is prescribed by a professional podiatrist, who will make sure you have the right fit. Incorrectly fit orthotics can not only cause podiatry problems, they can throw your back and body out of alignment. Don’t skate if you’re feeling hurt or injured. These can be the signs that you are in an ill-fitting boot and can cause you a number of long-lasting injuries to your foot or other parts of your body.